The shovelhead motorcycle engine is one that many custom chopper owners are proud to own. This V-Twin powerhouse was manufactured by Harley Davidson beginning in 1966 and ending in 1985, and reflected refinements from the other types of V-Twin engines Harley had produced such as knucklehead and panhead engines. Power was increased again, to 65bhp in 1968, though capacity remained at the now familiar 74ci/1200cc. 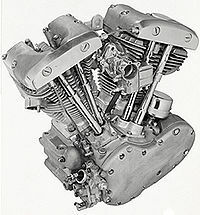 The "shovel" represented an offshoot of the panhead engine design but featured a slightly different look. The name of this engine was derived from the appearance of the rocker box covers. Because these covers bring to mind the head of coal shovels when inverted, the name shovelhead seems to simply be a natural progression. The shovel engines powered Harleys up until the introduction of the Evolution power house in 1985, ending the reign of the "shovel" as enthusiasts frequently call these engines. This page was last edited on 24 August 2010, at 01:49.